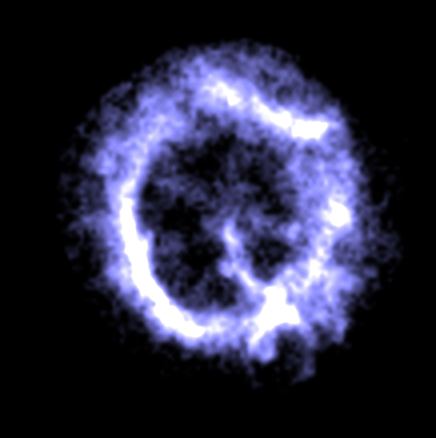 Explanation: The Q-shaped cloud seen in this false-color X-ray image from the orbiting Chandra Observatory is big ... about 40 light-years across. It's hot too, as its X-ray glow is produced by multi-million degree gas. Cataloged as E0102-72, this cosmic Q is likely a several thousand year old supernova remnant, the result of the death explosion of a massive star. A supernova can dramatically affect its galactic environment, triggering star formation and enriching the local interstellar medium with newly synthesized elements. This supernova remnant is located about 210,000 light-years away in our neighboring galaxy, the Small Magellanic Cloud (SMC), so the detailed Chandra X-ray image is impressive - particularly as it reveals what appear to be strange spoke-like structures radiating from the remnant's center.